There is only a couple of weeks in the year when the bitter Seville oranges arrive from their native orchards onto the stalls of London. And this is round about now! 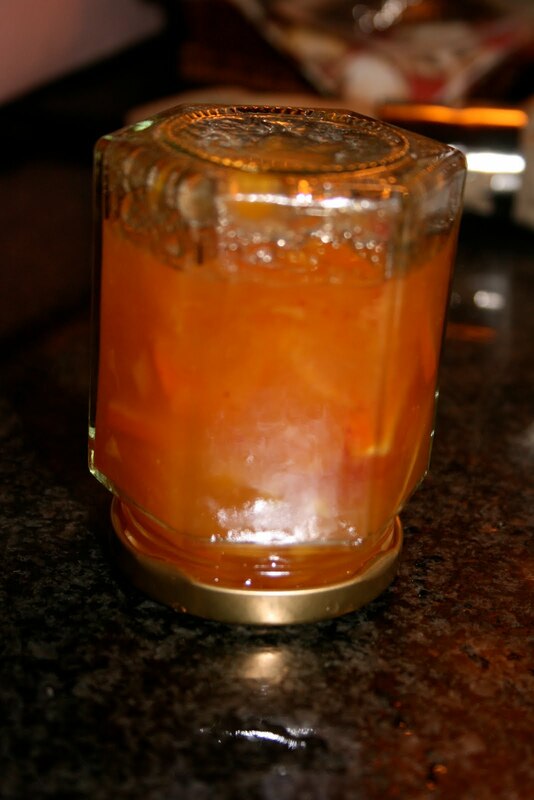 If you are lucky enough or perseverant enough to catch a few, here is a quick marmalade recipe to keep their uplifting fragrance and happy bite into jars so one can enjoy them long after their short season has passed! The day before, grate the sweet oranges and the lemon. Squeeze their juice and keep the skin of the lemon to shred finely, removing the pith. Keep also one whole sweet orange to slice then cut each slice into quarters. Squeeze the juice of all the oranges. You should be left with about 800 ml of juice. 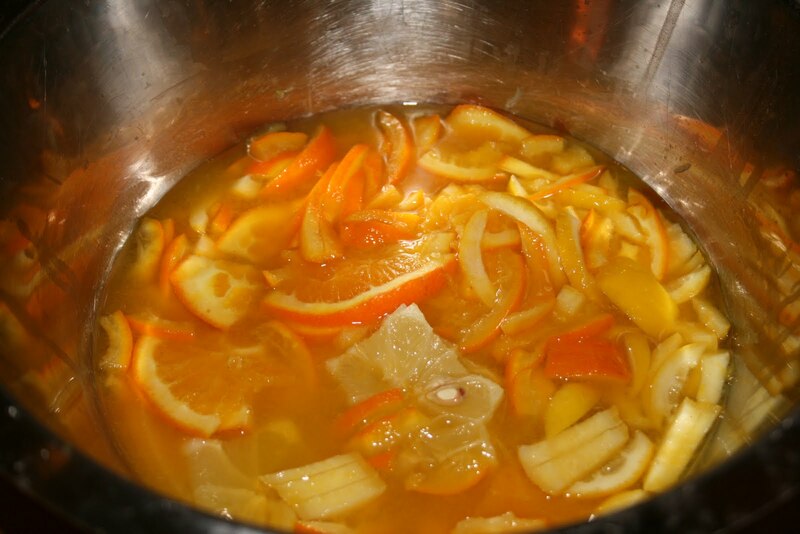 Pour the juice and sugar together with the shredded orange and lemon in a large bowl and reserve in the fridge until the next day. Keep all the pulp and left-over skins from juicing, cut them up and put into a bag of cheese-cloth tied with a string so you can pull it out later. The following day, sterilise 5 or 6 jars by putting them in the dishwasher or by rinsing them under boiling water. Pour the juice and sugar mix into a jam pan and boil to a slow roll until the skins are soft (1/2 hour max.). 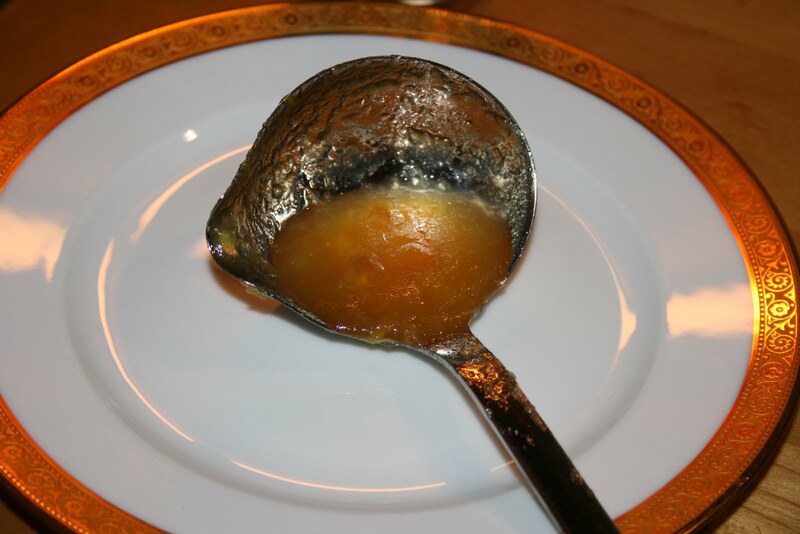 Test the setting by dropping a little juice onto a cold plate: it should be runny but sticky. Do not overset if like me you like the soft home-made style. At this point the kitchen smells like an orange-grove baking in the midday sun… Pull the bag out and squeeze it with tongs over the pan. At this stage, you can pour a drop of whisky into the pan if you so choose. Turn off the gas but quickly pot your nectar while it is as hot as lava- it saves sterilising afterwards! Carefully, pour the jam into clean jars, wipe the neck with a wet cloth if necessary and screw the top tightly. Put each jar upside down on a kitchen towel so the air in it will self-sterilise by passing through the boiling liquid. This makes a bitter and sharp marmalade, thanks to the Seville and the cooking apples. If you like it sweeter, simply add more sugar but I love the fresh and healthy taste of this low-sugar mix. There’ll be less guilt in the morning when spreading onto crisp toasts; in fact, you’ll feel glowing with pride – and considering the vitamin C, the calcium and the folate (Vit. B) you’ll be ingesting, you’ll soon glow with health too. Now for the last reason – should you still need one- to start making this: Natural Vitamin C such as the one found in fruit, boosts the body’s absorption of iron by nearly 400%!